Poison ivy rash (also called Rhus dermatitis or Toxicodendron dermatitis) is a red, itchy rash that is often marked by red bumps, blisters, and swelling. If your skin touches poison ivy or other plants in the same plant family such as poison oak or poison sumac, you can develop an allergic skin reaction. Some people have a reaction to urushiol, the oily resin found in the plant. When you're spending time outdoors, remembering the rhyme "Leaves of three, let it be" can help you steer clear of poison ivy plants. With three leaflets to a stem, poison ivy may grow as a shrub or climbing vine. Its texture, shape, and color are all highly variable. Poison ivy is most prevalent in the eastern United States. 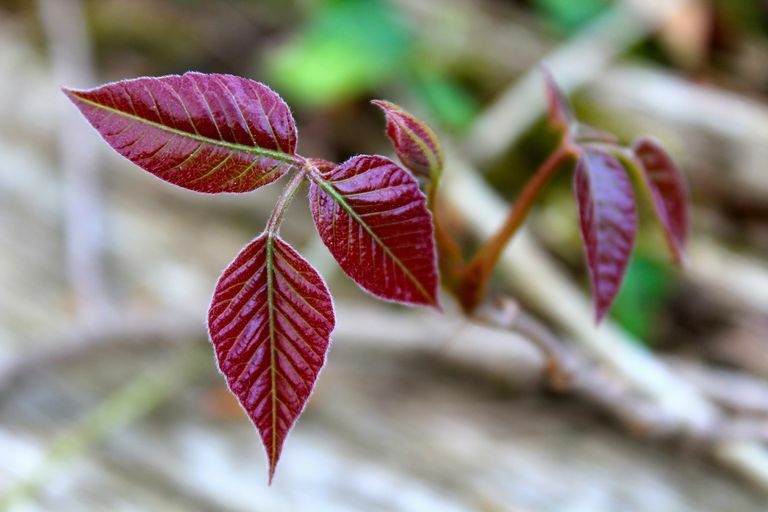 Although poison ivy rashes are often caused when the plant's leaves, stems, roots, or berries touch you directly, urushiol can also linger on your clothing, firewood, or a pet's fur and then transfer to your skin. Even inhaling the smoke from burned poison ivy plants can irritate your lungs, nasal passages, and throat. Redness, itching, red bumps, swelling, and blisters signaling a poison ivy reaction typically show up 12 to 48 hours after exposure and often last one to three weeks. The location of the rash depends on the area of skin exposed to urushiol, but common sites are the head, face, neck, trunk, legs, and arms. While the rash itself isn't contagious, contact with urushiol can spread the resin to someone else or to other parts of your body if it is not washed off after touching the plants. Although the clean rash won't spread from scratching, bacteria under your fingernails can set off a secondary infection. If you come in contact with poison ivy, cleaning the affected areas with soap and lukewarm water immediately after exposure can help control a poison ivy reaction. Applying an over-the-counter barrier cream made with bentoquatam (known to shield the skin against poison ivy) can offer protection as well. You should also wash any contaminated items or clothing with soap or detergent, and bathe your pets to get the oil out of their fur. Your healthcare provider may prescribe a treatment (such as a corticosteroid), but the condition is usually mild. It's important to note that severe poison-ivy symptoms (such as a fever higher than 100 F, difficulty breathing or swallowing, have many blisters or have yellow fluid oozing from them, have large areas affected, or irritation in sensitive areas like eyes and mouth) seek immediate medical treatment. In mild cases of poison ivy rash, home remedies may help to relieve the itching and redness. Although scientific support for the claim that natural remedies can treat poison ivy is lacking, here are some of the more common home remedies used to relieve the red, itchy rash. An organic compound sourced from peppermint and other mint plants or made synthetically, menthol has a cooling effect on skin and is a counter-irritant (a substance that distracts from the itch). Menthol is found in over-the-counter products like Gold Bond® anti-itch lotion. Menthol can also be found in peppermint essential oil, however, it is crucial that essential oils always be diluted to a safe amount for use on irritated skin. Soaking in a warm (but not hot) bath with colloidal oatmeal for 10 minutes or longer may help to soothe skin itching. Made from finely ground oats, colloidal oatmeal doesn't sink to the bottom of the bath. Instead, it is dispersed throughout the bath, coating skin and temporarily relieving the itch. Colloidal bath treatments and other oatmeal products are available at the drug store. Made from the leaves and bark of the Hamamelis virginiana plant, a liquid distillation of witch hazel can be applied topically to reduce itching and swelling. With its soothing, anti-inflammatory properties, topically applied aloe vera can help heal irritated skin. Applying cool compresses15 to 20 minutes per hour can soothe itchy skin. Soak a clean washcloth in cold water, wring it out, and apply it to itchy skin areas. Home remedies may help to soothe mild symptoms in some people, however there is still a lack of research on the effectiveness or safety. If you develop a skin rash, consult your healthcare provider. It's important to note that self-treating a condition and avoiding or delaying standard care may have serious consequences.